"Angel food cake, Butterfinger® candy bars and Cool Whip® are the well known favorites in this delightful (and easy) no-bake dessert. 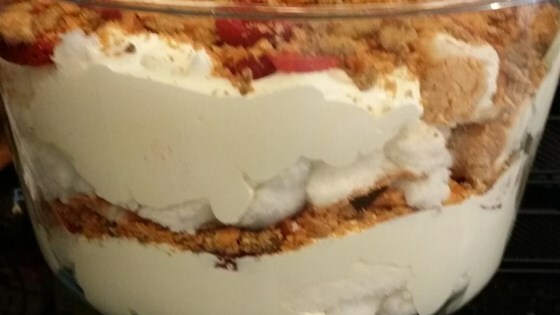 Looks great in a trifle bowl. I don't even like Butterfinger® bars and I thoroughly enjoy this stuff!! You can do this in a 9x13-inch pan as well, but the trifle looks so nice!" Beat confectioners' sugar, butter, and egg yolks together in a large bowl with an electric mixture until creamy. Fold whipped topping into the mixture. Spread 1/2 the angel food cake pieces on the bottom of a trifle dish. Pour 1/2 the whipped topping mixture in an even layer over the cake pieces. Sprinkle 1/2 the crushed candy bars over the top. Repeat layers with remaining cake, whipped topping mixture, and crushed candy. Cover dish with plastic wrap and refrigerate for at least 1 hour before serving. Ridiculously sweet and tangy. Almost too rich. Sweet on sweet on sweet was a bit much, I think. Once in a year type of thing. I added sliced strawberries to it and it turned out great! Everyone loved it. I only use about a half cup of confectioners sugar. Can be used with any candy bars. Our family go to for birthdays!